As we have covered on this site, many examples of aggressive treatments aimed at fixing abnormal results have proved useless or harmful. Doing as much nothing as possible might be the prudent thing to do in many cases. Now, evidence suggests the same is true for cardiac drugs frequently given during codes. 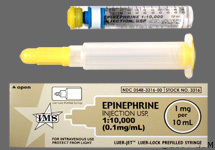 Is epinephrine useless after cardiac arrest? In a recent study, giving epinephrine during cardiac arrest resuscitation increased the risk of death. Medications for cardiac arrest have surprisingly little evidence (e.g. virtually none) to support their use, despite the most recent ACLS guidelines that recommend them. The rest of the rules (1-12) from House of God are a little questionable. Check them out on the Life in the Fast Lane blog.